A wind turbine is a rotating machine which converts the kinetic energy in wind into mechanical energy. If the mechanical energy is used directly by machinery, such as a pump or grinding stones, the machine is usually called a windmill. If the mechanical energy is then converted to electricity, the machine is called a wind generator, wind turbine, wind power unit (WPU), wind energy converter (WEC), or aerogenerator. This article discusses electric power generation machinery. Windmill discusses machines used for grain-grinding, water pumping, etc. The article on wind power describes turbine placement, economics and public concerns. The wind energy section of that article describes the distribution of wind energy over time, and how that affects wind-turbine design. See environmental concerns with electricity generation for discussion of environmental problems with wind-energy production. Wind machines were used in Persia as early as 200 B.C. This type of machine was introduced into the Roman Empire by 250 A.D. However, the first practical windmills were built in Sistan, Iran, from the 7th century. These were vertical axle windmills, which had long vertical driveshafts with rectangle shaped blades. Made of six to twelve sails covered in reed matting or cloth material, these windmills were used to grind corn and draw up water, and were used in the gristmilling and sugarcane industries. By the 14th century, Dutch windmills were in use to drain areas of the Rhine River delta. In Denmark by 1900 there were about 2500 windmills for mechanical loads such as pumps and mills, producing an estimated combined peak power of about 30 MW. The first known electricity generating windmill operated was a battery charging machine installed in 1887 by James Blyth in Scotland, UK. The first windmill for electricity production in the United States was built in Cleveland, Ohio by Charles F Brush in 1888, and in 1908 there were 72 wind-driven electric generators from 5 kW to 25 kW. The largest machines were on 24 m (79 ft) towers with four-bladed 23 m (75 ft) diameter rotors. Around the time of World War I, American windmill makers were producing 100,000 farm windmills each year, most for water-pumping. By the 1930s windmills for electricity were common on farms, mostly in the United States where distribution systems had not yet been installed. In this period, high-tensile steel was cheap, and windmills were placed atop prefabricated open steel lattice towers. A forerunner of modern horizontal-axis wind generators was in service at Yalta, USSR in 1931. This was a 100 kW generator on a 30 m (100 ft) tower, connected to the local 6.3 kV distribution system. It was reported to have an annual capacity factor of 32 per cent, not much different from current wind machines. The first utility grid-connected wind turbine operated in the UK was built by the John Brown Company in 1954 in the Orkney Islands. It had an 18 meter diameter, three-bladed rotor and a rated output of 100 kW. where P = power in watts., α = an efficiency factor determined by the design of the turbine, ρ = mass density of air in kilograms per cubic meter, r = radius of the wind turbine in meters, and v = velocity of the air in meters per second. As the wind turbine extracts energy from the air flow, the air is slowed down which causes it to spread out. Albert Betz, a German physicist, determined in 1919 (see Betz' law) that a wind turbine can extract at most 59% of the energy that would otherwise flow through the turbine's cross section, that is α can never be higher than 0.59 in the above equation. The Betz limit applies regardless of the design of the turbine. This equation shows the effects of the mass rate of flow of air traveling through the turbine, and the energy of each unit mass of air flow caused by its velocity. As an example, on a cool 15 °C (59 °F) day at sea level, air density is 1.225 kilograms per cubic metre. An 8 m/s (28.8 km/h or 18 mi/h) breeze blowing through a 100 meter diameter rotor would move almost 77,000 kilograms of air per second through the swept area. The total power of the example breeze through a 100 meter diameter rotor would be about 2.5 megawatts. Betz' law states that no more than 1.5 megawatts could be extracted. Wind turbines can be separated into two types based by the axis in which the turbine rotates. Turbines that rotate around a horizontal axis are more common. Vertical-axis turbines are less frequently used. Since a tower produces turbulence behind it, the turbine is usually pointed upwind of the tower. Turbine blades are made stiff to prevent the blades from being pushed into the tower by high winds. Additionally, the blades are placed a considerable distance in front of the tower and are sometimes tilted up a small amount. Downwind machines have been built, despite the problem of turbulence, because they don't need an additional mechanism for keeping them in line with the wind, and because in high winds, the blades can be allowed to bend which reduces their swept area and thus their wind resistance. Since turbulence leads to fatigue failures, and reliability is so important, most HAWTs are upwind machines. Doesburger windmill, Ede, The Netherlands. These squat structures, typically (at least) four bladed, usually with wooden shutters or fabric sails, were developed in Europe. These windmills were pointed into the wind manually or via a tail-fan and were typically used to grind grain. In the Netherlands they were also used to pump water from low-lying land, and were instrumental in keeping its polders dry. In Schiedam, the Netherlands, a traditional style windmill (the Noletmolen) was built in 2005 to generate electricity. The mill is one of the tallest Tower mills in the world, being some 42.5 metres (139 ft) tall. The Eclipse windmill factory was set up around 1866 in Beloit, Wisconsin and soon became successful building mills for pumping water on farms and for filling railroad tanks. Other firms like Star, Dempster, and Aeromotor also entered the market. Hundreds of thousands of these mills were produced before rural electrification and small numbers continue to be made. They typically had many blades, operated at tip speed ratios (defined below) not better than one, and had good starting torque. Some had small direct-current generators used to charge storage batteries, to provide power to lights, or to operate a radio receiver. The American rural electrification connected many farms to centrally-generated power and replaced individual windmills as a primary source of farm power by the 1950s. They were also produced in other countries like South Africa and Australia (where an American design was copied in 1876). Such devices are still used in locations where it is too costly to bring in commercial power. Turbines used in wind farms for commercial production of electric power are usually three-bladed and pointed into the wind by computer-controlled motors. These have high tip speeds of up to six times the wind speed, high efficiency, and low torque ripple, which contribute to good reliability. The blades are usually colored light gray to blend in with the clouds and range in length from 20 to 40 metres (65 to 130 ft) or more. The tubular steel towers range from 200 to 300 feet (60 to 90 metres) tall. The blades rotate at 10-22 revolutions per minute. A gear box is commonly used to step up the speed of the generator, although designs may also use direct drive of an annular generator. Some models operate at constant speed, but more energy can be collected by variable-speed turbines which use a solid-state power converter to interface to the transmission system. All turbines are equipped with shut-down features to avoid damage at high wind speeds. Variable blade pitch, which gives the turbine blades the optimum angle of attack. Allowing the angle of attack to be remotely adjusted gives greater control, so the turbine collects the maximum amount of wind energy for the time of day and season. The tall tower base allows access to stronger wind in sites with wind shear. In some wind shear sites, every ten meters up, the wind speed can increase by 20% and the power output by 34%. HAWTs have difficulty operating in near ground, turbulent winds. The tall towers and blades up to 90 meters long are difficult to transport. Transportation can now cost 20% of equipment costs. Tall HAWTs are difficult to install, needing very tall and expensive cranes and skilled operators. Massive tower construction is required to support the heavy blades, gearbox, and generator. Reflection on tall HAWTs may affect side lobs of radar installations creating signal clutter, although filtering can suppress it. Their height makes them obtrusively visible across large areas, disrupting the appearance of the landscape and sometimes creating local opposition. Downwind variants suffer from fatigue and structural failure caused by turbulence. HAWTs require an additional yaw control mechanism to turn the blades toward the wind. Vertical-axis wind turbines (or VAWTs) have the main rotor shaft arranged vertically. Key advantages of this arrangement are that the turbine does not need to be pointed into the wind to be effective. This is an advantage on sites where the wind direction is highly variable. VAWTs can utilize winds from varying directions. With a vertical axis, the generator and gearbox can be placed near the ground, so the tower doesn't need to support it, and it is more accessible for maintenance. Drawbacks are that some designs produce pulsating torque. Drag may be created when the blade rotates into the wind. It is difficult to mount vertical-axis turbines on towers, meaning they are often installed nearer to the base on which they rest, such as the ground or a building rooftop. The wind speed is slower at a lower altitude, so less wind energy is available for a given size turbine. Air flow near the ground and other objects can create turbulent flow, which can introduce issues of vibration, including noise and bearing wear which may increase the maintenance or shorten the service life. However, when a turbine is mounted on a rooftop, the building generally redirects wind over the roof and this can double the wind speed at the turbine. If the height of the rooftop mounted turbine tower is approximately 50% of the building height, this is near the optimum for maximum wind energy and minimum wind turbulence. No massive tower structure is needed. As the rotor blades are vertical, no yaw mechanism is needed. A VAWT can be located nearer the ground, making it easier to maintain the moving parts. VAWTs have a higher airfoil pitch angle, giving improved aerodynamics while decreasing drag at low and high pressures. Straight bladed VAWT designs with a square or rectangular cross-section have a larger swept area for a given diameter than the circular swept area of HAWTs. VAWTs have lower wind startup speeds than HAWTs. Typically, they start creating electricity at 6 m.p.h. (10 km/h). VAWTs usually have a lower tip speed ratio and so are less likely to break in high winds. VAWTs may be built at locations where taller structures are prohibited. VAWTs situated close to the ground can take advantage of locations where mesas, hilltops, ridgelines, and passes funnel the wind and increase wind velocity. VAWTs do not need to turn to face the wind if the wind direction changes. VAWT blades are easily seen and avoided by birds. Most VAWTs start easily and do not require energy to begin turning. Most VAWTs produce energy at only 50% of the efficiency of HAWTs in large part because of the additional drag that they have as their blades rotate into the wind. Versions that reduce drag produce more energy, especially those that funnel wind into the collector area. VAWTs will rotate faster in stronger winds at higher elevations as they rotate at least as fast as the wind velocity. A VAWT that uses guy-wires to hold it in place puts stress on the bottom bearing as all the weight of the rotor is on the bearing. Guy wires attached to the top bearing increase downward thrust in wind gusts. Solving this problem requires a superstructure to hold a top bearing in place to eliminate the downward thrusts of gust events in guy wired models. While VAWTs' parts are located on the ground, they are also located under the weight of the structure above it, which can make changing out parts nearly impossible without dismantling the structure if not designed properly. 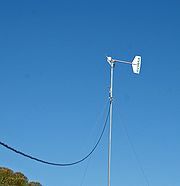 Small wind turbines may be as small as a fifty-watt generator for boat or caravan use. Small units often have direct drive generators, direct current output, aeroelastic blades, lifetime bearings and use a vane to point into the wind. Larger, more costly turbines generally have geared power trains, alternating current output, flaps and are actively pointed into the wind. Direct drive generators and aeroelastic blades for large wind turbines are being researched. Wind turbines have very few impacts on the environment other than aesthetic effects, although VAWT designs are increasingly being designed with innovative artistic aesthetics. Wind Turbine Syndrome is a clinical phenomenon first coined by Nina Pierpont. According to her research, some people, when living in close proximity to horizontal axis industrial wind turbines, are affected by low-frequency vibrations emanating from the turbine. VAWT do not lend themselves to this effect as they do not rotate faster than wind speed. Ahmad Y Hassan, Donald Routledge Hill (1986). Islamic Technology: An illustrated history, p. 54. Cambridge University Press. Donald Routledge Hill, "Mechanical Engineering in the Medieval Near East", Scientific American, May 1991, p. 64-69. Iowa Energy Center Wind Energy Manual. This the first social networking website that has to do with the wind energy community. Visitors to www.windturbines.net have the opportunity to open up a free account where they can communicate, collaborate and network with other like-minded individuals. They are also in the process of creating the most complete resource / wiki (www.windturbines.net/wiki) having to do with the topic of wind turbines and wind energy.